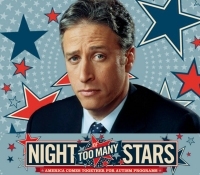 "Night of Too Many Stars: America Comes Together for Autism Programs" is hosted by Jon Stewart and raises money for autism programs, schools, and services all over the country. Performers include Tina Fey, Seth Rogen, Amy Poehler, Stephen Colbert, Louis CK, Bill Burr, Katy Perry, Carly Rae Jepsen, Tom Morello, Sting and many more. A highlight of the evening was a poignant performance of "Firework" by Katy Perry and Jodi DiPiazza. For more highlight previews, check out www.youtube.com/. Sunday night's live celebrity phone bank includes Tom Hanks, Jerry Seinfeld, Julianne Moore, Seth Meyers, Jimmy Kimmel and Al Pacino. To help give people with autism the chance they deserve to reach their potential, please visit http://cc.com/donate or text STARS to 50555 to donate $10.